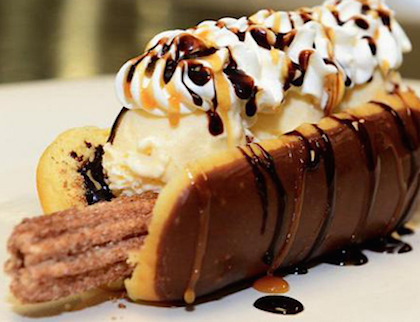 You can buy a 1,117-calorie Churro Dog topped with whipped cream and chocolate sauce for $8.50, but it’s for baseball fans at Chase Stadium and Chase Stadium in Phoenix, AZ alone. Bacon sundaes are coming to Burger King. This is what I’ve been waiting for all my life, which will be short-lived once I get my hands on one of these. 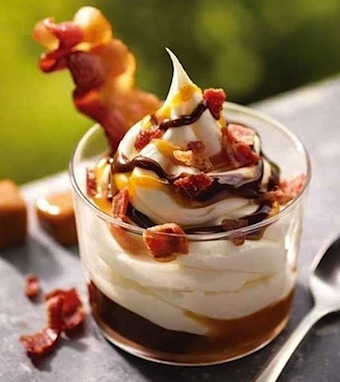 The item, which is made with vanilla soft serve, fudge, caramel, and thick-cut bacon will be added to their American menu in wide release for summer. It has 61 grams of sugar, 18 grams of fat and contains 510 calories. Is it sad that that’s not as many as I expected? Their new menu item, the “Mac ‘n Cheese Big Daddy Patty Melt “contains one beef patty with pale low-grade Mac ‘N Cheese oozing on top of it, plus an extra dose of melted cheddar, with frisco sauce (1000 island dressing) in between grilled potato bread. AND it comes with french fries. Sixteen thousand and ninety calories! With 99 grams of fat? ?